Here’s a story of a day when I got really mad and uppity. My email inbox can be peppered with notes about new wines, new beers, new wine gadgets, new styles of tea, new books, new anythings to be honest. One day I had an email from a London Chap. I’ll just call him a London Chap because the words I used on the day were much stronger and not to be repeated here. So the said London Chap had written to tell me (and no doubt lots of other people on his group email) about a new wine website which was going to sell practically all the wines under the sun, at great prices and with no delivery charges. I was furious. Though I stayed calm on the phone. How dare he patronise those of us who love wine but don’t live in London!! Needless to say I haven’t written anything about his new venture. But it got me a-thinking. Generally lots of the trade shows and press tastings are in London and little ol’ me has to book time off from the day job and jump on trains to get down to them. It’s really worth the effort if I can get there, not just to sample the new wines that are coming on the market, but also to meet the PRs who generally are my information lifelines; plus I get to chat with other wine journos. But there’s one retailer I visit Up North. I’ve been over to the Co-op’s Manchester offices a couple of times now, to have a talk-through tasting with their buyers. It saves me going to London and Lo!! despite the Co-op being a northern company they know a thing or two about wine. So up y****s Mr London Chap. The very afternoon I’d sizzled with resentment at his comments, I was over in Manchester, talking about some Christmas wine options. What is it: It’s a red wine. I think you can see that. Where’s it from: Argentina, the Mendoza region – find out some techie stuff here. 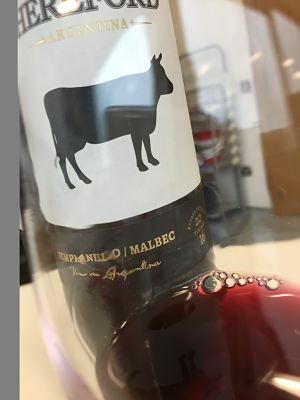 The grapes: The Hereford is equal parts malbec – now hugely embraced by Argentina – and tempranillo. In Spain, tempranillo is the mainstay of rioja wines. What of the taste? This is a real mix of New World meeting Old World. The winemaker Gonzalo Abadia has taken these two classic grapes and blended them into a wine with young, fresh dark and red berries with a tumble of spice and ever-so slight hints of violets; all held together by a good acidity and tannins which don’t overpower. Great with a midweek winter beef stew when your toes are cold. The small print. The wine is 12% abv, is unoaked and has a screwcap. The RRP is £6.69 and the wine is available nationwide at the Co-op. I’m guessing Cambo likes this one! I think he reviewed it once – the word “Hereford” was the factor that sold it to him!